which way is the qibla*?" here's your Ka'ba. behold a rock! that of Majnun is Layli's face. * Qibla is an arabic word for the direction that Muslim face for praying. It is a symbol of unification for all of humanity to face a Singular Point signifying the one direction towards God. 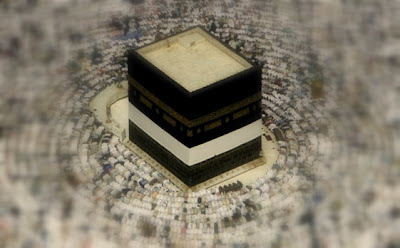 Physically on earth the location of Ka'ba in Mecca is the point of direction (qibla) for all Muslims. The Kaaba is in the middle of the world. All faces turn toward it. each is worshiping the soul of each. there is the Presence of God. Truly God is Vast, Knowing.